For the MS-DOS compilation, see Advanced Dungeons & Dragons Masterpiece Collection. The collection comes on two discs; Shadow over Mystara requires the 4 MB expansion cartridge to run, but Tower of Doom does not. Both games suffer from frequent pauses to load data. The games have slight aesthetic changes from their arcade counterparts (the saving throw stick graphics have been replaced with a D-pad, and corpses and objects fade out of existence rather than flickering), and certain things that required three or four players have been adjusted to require only one or two. 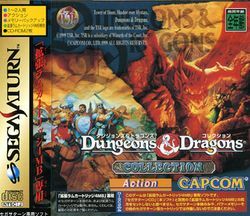 While some options are configurable there can only be two players, and there is no way to select the language so the games are only in Japanese. Capcom did not set a limited number of continues like in most of their arcade conversions; both games have infinite continues, meaning players can finish the games regardless of how often they die. This collection is considered to be very rare (Capcom only produced it for a limited time) and regularly fetches high prices on auction sites. This page was last edited on 24 September 2017, at 14:15.